Wildlife experts have arrived on St Kilda in a bid to safeguard the area's huge bird population. The islands' owner, the National Trust for Scotland, said it feared rodents had swum ashore from a trawler which was wrecked on its rocks last week. The Spinningdale's 14 crew were airlifted off when it ran aground on St Kilda, 44 miles west of Benbecula. The trust has said that just one pregnant female rat could devastate the puffins and gannets on the island. St Kilda, which is a group of islands designated a World Heritage Site, is home to unique breeds of sheep and mice and 500,000 seabirds, many of whom nest on the ground. It is believed that their chicks and eggs could be at risk from hungry rodents. Abbie Patterson, national species recovery officer for the NTS, with assistant John Sinclair arrived on Hirta, the main island of St Kilda, at lunch-time to investigate the possible presence of rats. None have been found so far. Environment Minister Mike Russell, who visited St Kilda last summer, said he was very concerned and he said he would be keeping a close eye on the situation. The trust has already laid traps on the island of Hirta. 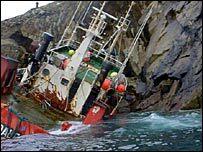 The Marine Accident Investigation Branch will launch an investigation into the grounding of the Spanish trawler.